A gamer’s delight, the Vertagear SL5000 will hit the sweet spot for extreme gamers. With a racing inspired design, it empowers the everyday gamers with the right features. An instantly-recognisable style lets the world know how serious you are about gaming. Featuring additional lumbar and neck support, the SL5000 reclines to a generous 170 degree angle to suit any setup. Slide across the floor with the formulated soft-glide wheels, and be supported by the stable, 5 star aluminium alloy base. 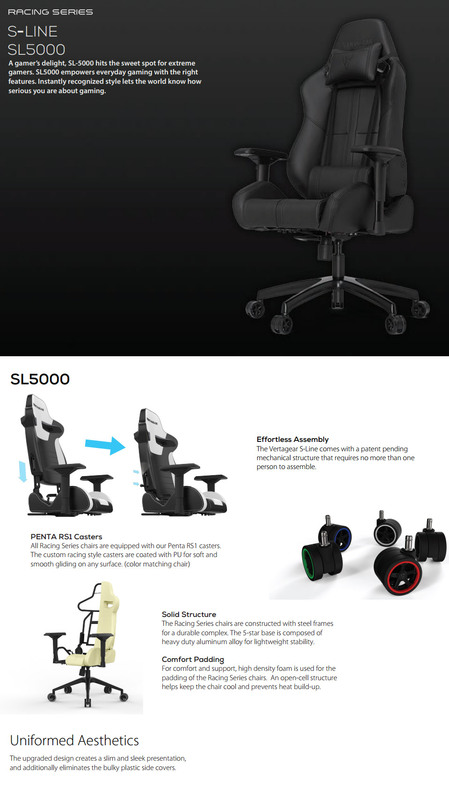 Designed to handle up to 150kg, the SL5000 is backed by a 2 year Vertagear warranty.